Alexander Etz and Eric-Jan Wagenmakers from the Department of Psychology of the University of Amsterdam just arXived a paper on the invention of the Bayes factor. In particular, they highlight the role of John Burdon Sanderson (J.B.S.) Haldane in the use of the central tool for Bayesian comparison of hypotheses. In short, Haldane used a Bayes factor before Jeffreys did! The authors analyse Jeffreys’ 1935 paper on significance tests, which appears to be the very first occurrence of a Bayes factor in his bibliography, testing whether or not two probabilities are equal. They also show the roots of this derivation in earlier papers by Dorothy Wrinch and Harold Jeffreys. [As an “aside”, the early contributions of Dorothy Wrinch to the foundations of 20th Century Bayesian statistics are hardly acknowledged. A shame, when considering they constitute the basis and more of Jeffreys’ 1931 Scientific Inference, Jeffreys who wrote in her necrology “I should like to put on record my appreciation of the substantial contribution she made to [our joint] work, which is the basis of all my later work on scientific inference.” In retrospect, Dorothy Wrinch should have been co-author to this book…] As early as 1919. 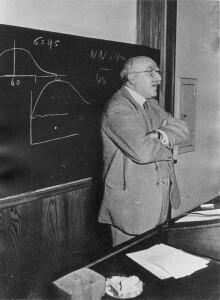 These early papers by Wrinch and Jeffreys are foundational in that they elaborate a construction of prior distributions that will eventually see the Jeffreys non-informative prior as its final solution [Jeffreys priors that should be called Lhostes priors according to Steve Fienberg, although I think Ernest Lhoste only considered a limited number of transformations in his invariance rule]. The 1921 paper contains de facto the Bayes factor but it does not appear to be advocated as a tool per se for conducting significance tests. Another amazing fact I gathered from the historical work of Etz and Wagenmakers is that Haldane and Jeffreys were geographically very close while working on the same problem and hence should have known and referenced their respective works. Which did not happen. This entry was posted on November 27, 2015 at 12:15 am and is filed under Books, Statistics with tags Bayes factors, full Bayesian significance test, Haldane's prior, Harold Jeffreys, Jack Haldane, Jeffreys priors, non-informative priors, scientific inference. You can follow any responses to this entry through the RSS 2.0 feed. You can leave a response, or trackback from your own site.